Bent on the destruction of BATMAN™, Gotham City’s most vile criminals have formed a new alliance as Batman Rogues Wood Nesting Dolls – Set of 5 from Bif Bang Pow!, which is in stock today at entertainmentearth.com. Batman Rogues Wood Nesting Dolls – Set of 5 is a premium, collectible nesting doll set that features THE JOKER™, CATWOMAN™, THE RIDDER™, THE PENGUIN™, and HARLEY QUINN™ as a sinister gang of misfits in a clever and sturdy doll-inside-of-a-doll nesting system. Each doll is cloaked with intricate 360-degree artwork that captures the celebrated appearance of each character’s mystique from every angle. For well over 100 years, matryoshka dolls, also known as Russian nesting dolls, have charmed children and collectors alike. This menacing set of 5 dolls ranges in size from 2- to 6-inches tall and is comprised of hand-painted details alongside limited decal artwork, offering a one-of-a-kind authentic look that can’t be duplicated. And the best part is Bif Bang Pow! 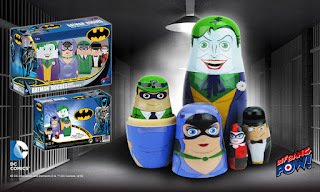 also has Batman Family Wood Nesting Dolls – Set of 5, so you can enjoy both the villains and heroes of Gotham City in this unique form. Ages 14 and up.